Kingview is a High-Performance PC Software for Building Data Information Service Platforms or SCADA Systems, comes with an hour of free web based training which can be catered around your project. Allows publishing and logging of web camera data. Web Client option offers web publishing capability so system can be viewed over a web page. Comes with an hour of free web based training. *Contact sales at 1-888-971-9888 for details. Use an IP Camera to stream through KingView for publishing on a web page on the KingView page. Starts at $399. Comes with an hour of free web based training which can be catered around your project. KingView allows you to develop Windows based control, monitoring and data collection applications. You can trigger outputs and events based on input data, create graphs and trend charts for analysis and you can send alarms based on configurable conditions. Kingview can be used to build a data information service platform in the automation field. Kingview software provides graphic visualization to help your operations management, control and optimization. Kingview is widely used in power, water conservancy, building, coal mines, environmental protection, metallurgy and so on. 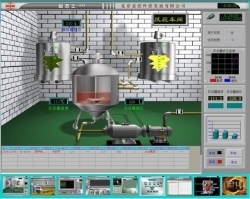 Kingview software is used in national defense and Aero-Space in China. KingView V6.53 supports Windows XP, Windows 2000 Professional, Server or Advanced Server, Windows 2003 Server (Standard and Enterprise Editions), Windows 7, and Vista. *KingView NetView is KingView client only. It can only write or read data from KingView Runtime as I/O Server through Ethernet, instead of through I/O driver, include OPC or DDE. All other KingView functionality is present. Database Access is allowed. Here is a demo for water quality monitoring system that can monitor the pollution information and water quality. Diversiform methods to build I/O points. Note:PC prevailing on the market at present satisfy fully system requirement of KingView. Main Functions 1. Supports C based scripting, easy-to-learn, easy-to-use; Provide rich functions used in script. 2. Supports 3rd-party interfaces such as ODBC, OPC, DDE, ActiveX, API, etc. 3. Provides rich graphs to display various values, such as trend curves, report, comparison curves, pie, and cylinder chart, x-y chart, etc. 4. Provides rich genius in the library. 5. Record history information, alarm information, event information, etc. 7. Supports historical trend curves and realtime trend curves. 8. Supports network settings, redundancy and other kind of deployments. 9. Supports runtime system redundancy, has heartbeat detection, historical data archive. 10. Supports accessing relational database, data storage and data querying. 11. Provides an open programming interface, easy-to-function expansion. 12. Supports web publish, runtime projects can be accessed by customers through browsers such as IE or other browsers. 12. Supports Alarm information archive and querying. 7. Supports a variety of common PLC, smart cards and other instruments and modules. COMMUNICATION OF KINGVIEW SCADA IS WITH ALLEN BRADLEY PLC THROUGH OPC USING RS LINKS CLASSIC.WE ARE ABLE TO RECIEVE THE CONTROLLER TAGS IN RS LINKS BUT SAME IS NOT BEEN DISPLAYED IN SCADA.IS ANY OPC SETTING ARE REQUIRED TO BE CONFIGURED IN SCADA OPC ? I need help on how to use kingview SCADA 6.52 through OPC. Hi Amit, What kind of OPC server are you using?